The project was back at the Cheltenham Science Festival this weekend. 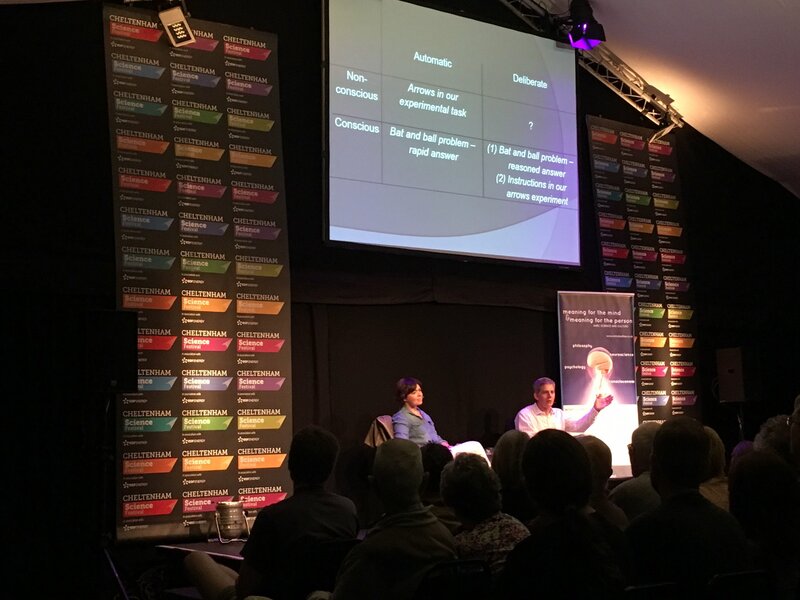 Five of us visited the festival last year to talk about consciousness with visitors. Eoin Travers gathered data from over 40 willing participants in a simple psychological experiment. This year I returned to give a talk about the project’s question of ‘What is Consciousness For?’ In conversation with Ophelia Deroy (LMU and IP), I discussed the background to the question and revealed what the experiments last year had shown. The event was sold out, with a very engaged audience, who had lots of probing questions, with many going to on continue the discussion at ‘conversation corner’ afterwards. Not only is it heartening to see that so many people are interested in our research questions – I also got quite a lot of food for thought. Many thanks to Barry Smith (AHRC Science in Culture Leadership Fellow) for introducing the event, and of course to the AHRC for their support.